Flavia C500 Coffee Brewer. Commercial quality and build. Designed to handle brews per day or more. Easy and intuitive. Superior makes a better cup of coffee. The C500 represents a major upgrade over the C400 model. You can taste the difference. Just buy your coffee supplies from us. Designed for companies that drink more than 15 cups a day, per brewer. 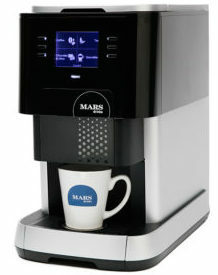 We also have a brewer that is designed for companies drink 8 cups a day.